Despite the noteworthy decrease in the number of irregular immigrants arriving in Europe, immigrant smuggling continues to be a profitable and vital activity for organised crime in the European Union. The Europol activity report on the two years the European Migrant Smuggling Centre (EMSC) has been functioning provides a detailed insight into the development and trends of migrant smuggling. Since the migration crisis in 2015, the business of migrant smuggling has been consolidated as a broad and lucrative criminal market, and continues to represent a highly profitable business in which criminals run a low risk of being detected. The model of business of the criminals involved in this crime continues to evolve and responds to the dynamic and needs of migrant flows. Many factors, including the introduction of policies, police activity and budget preferences and irregular immigrant travel, have an impact on migration routes and the operational means used by smugglers. The criminals quickly adapt to change and show great versatility with the methods of transport and technology they use. They are increasingly organised, and set up sophisticated professional networks that operate in transnational terms from the starting point to the target country. According to Robert Crepinko, head of the European migrant smuggling centre, “smuggling migrants to the European Union anticipates the use of advanced technology, particularly related to document fraud, the increase in the use of genuine documents and resorting to travel without the appropriate visa, and it will have a significant impact on the future of the nature of migrant smuggling”. Document fraud is a key factor in migrant smuggling. Falsified documents, or those obtained illegally that smugglers have more and more access to, allow irregular immigrants to enter the EU and move around within it. Travel without the necessary visa: irregular immigrants try to enter the EU by air via non-community Balkan countries, using non-visa travel plans. Several Balkan countries introduced the liberalisation of visas for citizens of, among other countries, China, Guinea- Bissau, Iran and Turkey, which allows immigrants to enter a country as a tourist with the right to stay for up to 30 days. Social media continues to be used widely to publicise smuggling services. Criminals use a range of marketing techniques, for example, offering discounts for extra migrants. Modi operandi: criminals use sophisticated and often threatening methods to conceal the smuggling of migrants across borders. The participation of organised police criminal groups in migrant trafficking and other criminal activities is significant. It involves an enormously lucrative activity with relatively low levels of risk. 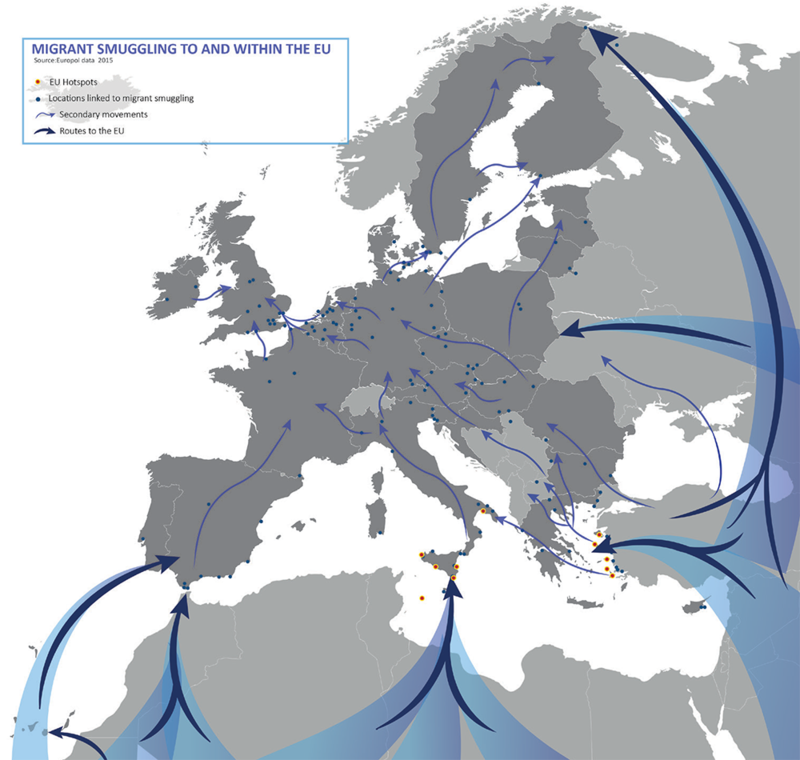 Major migrant smuggling routes of note include: the central Mediterranean route, the western Mediterranean route, the western Balkans and the borders of the UK and France. The EMSC of Europol was founded at the start of 2016, after a period of very active irregular migration, with vulnerable migrants who mainly travelled unhindered in large groups across the Mediterranean, from external land borders and beyond the EU. Europol has verified that many immigrants are provided with the journey by criminal organisations. The basic task of the EMSC is to give support, with the collaboration of Eurojust and Frontex, to cross border investigations to stop and pursue organised criminal groups.